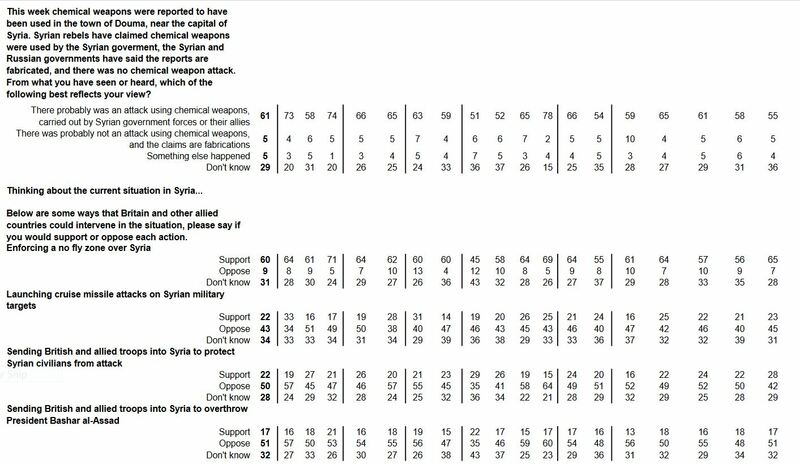 61% of UK voters believe there probably was an attack using chemical weapons, carried out by Syrian Government forces or their allies. 60% of UK voters support enforcing a no fly zone over Syria. 60% of UK voters support a proportionate use of military force to bring some immediate support and relief to those at the risk of further chemical weapons attacks. Such a measured use of military force does not preclude or rule out adopting other short, medium and long term options to end the use of chemical weapons in Syria and elsewhere. In fact, it compliments them. A very great Foreign Secretary of the mid twentieth century once observed … Jeremy Corbyn when presented with two choices, neither of which are particularly palatable, will always, it seems, go with the third, the option of masterly, virtuous, hand wringing inaction. Sooner or later, Corbyn is going to realise that his lifelong habit of being a(n un)principled critic, enjoying the prerogative of the harlot down through the ages, power without responsibility, ended on the day he first became Labour leader. He seems to think that his over thirty years in Opposition to his own party and the Government has somehow schooled him on what it is to be Prime Minister. There are rarely comfort blanket third options when faced with a binary choice. Unless, of course, you are campaigning for staying in an organisation which you opposed, with might and main, for the previous forty years?